Compromise, it would seem, is not a dirty word at Mitsubishi. Realising that many buyers wanted a full seven seat MPV but didn't want something that steered like a supertanker and was a nightmare to park the Space Wagon evolved. Larger than those mini-MPVs that can seat seven toddlers yet still a manageable size it has proved particularly popular in third generation guise. With used examples now looking very tempting, perhaps its time to boldly go and appraise the appeal of Mitsubishi's family friendly favourite. The Space Wagon name can be traced right back to the mid 1980s 'Mystery Machine' version and has become ever more refined and sophisticated. At the beginning of 1999, a new, even larger, third generation Space Wagon was introduced. It still looked car-like but had enough room inside to sternly challenge larger MPVs. Only one petrol engine option was available but this time it was Mitsubishi's high-tech, fast-yet-frugal 2.4-litre Gasoline Direct Injection (GDI) unit. A 2.0-litre model was subsequently introduced to cater for the budget end of the market. There were initially three levels of trim offered on early 2.4 models - GL, GLX and GLS - but in 2000 this was rationalised to coincide with the introduction of the 2.0-litre version. 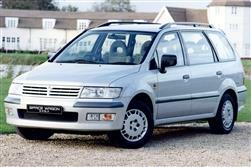 A three model range was then available to Space Wagon buyers, 2.0-litre Classic or 2.4-litre GDI Equippe and Elegance. The Elegance trim level only lasted a year. Both GL and GLX models offer a seven-seat layout in three rows, the second row a bench for three. Alternatively, the plushest GLS has two separate middle seats giving six-seat capacity and a walk-through centre aisle, thanks to the column-mounted gear lever. Whichever configuration you choose, both the bench and the individual seats offer 180mm of adjustment to suit the needs of the long-legged wherever you happen to put them. Though you can't remove the middle row completely, you can fold it flat (to create a table) or forward (to maximise cargo space if you need a van). The two third-row seats can be removed, creating up to 1,930 litres of luggage space. Alternatively, they too can be folded forward. Everything you need is in there, including a central black and white LCD screen for time, temperature, fuel consumption and stereo. Find a Space Wagon with the optional satellite navigation and it displays route directions, too. Twin front airbags are standard and GLS customers get side airbags. Only the GL does without anti-lock brakes. Post October 2000 Equippe models have the Classic's bench arrangement in the middle seat area - unlike the old six-seater flagship Elegance variant which had two separate middle seats for a six-seat capacity with a centre 'walk-through' aisle. Even with all the seats in place, however, there's still 240 litres of space. The designers have also given plenty of thought to oddment storage. All around the cabin, you'll find door pockets and cup holders, even for those at the very back. There are also trays under the front passenger seat and under the floor in the luggage area. At the wheel, Mitsubishi have worked hard to create the air of a luxury estate - and partly succeeded. Certainly, all the accoutrements are there, including a central black and white LCD screen showing the time, the exterior temperature and the instantaneous fuel consumption, plus all the audio system information. The Equippe has an automatic gearbox (with no manual option). (approx based on a 2001 Classic - ex Vat) A clutch assembly is around £345 and an exhaust system about £440. Front and rear brake pads will be in the vicinity of £45 a set. A radiator is about £200, an alternator about £150 and a starter motor £155. Under the bonnet, as well as the 2.0-litre unit that powers the entry-level Classic model, there's a 2.4-litre 147bhp version of Mitsubishi's revolutionary Gasoline Direct Injection (GDI) engine which claims to set new standards in economy and performance and satisfy both diesel and petrol buyers (hence the lack of many other engine options). The reality is that both will have to compromise a little but not much (combined consumption 31mpg and maximum speed 115mph). Such is the ingenuity of the GDI technology that the 2.0-litre Classic model is both slower and thirstier. You won't expect sports car responses out on the road (and you won't get them) but having said that, the Space Wagon is a confident handler - certainly far more accomplished than its uninspiring predecessor. The gear lever is mounted at the bottom of the centre console and claims to have a 'sports shift feel': you shouldn't get your hopes up. All will like the nimble manoeuvrability in town (there's a minimum turning circle of just 11 metres) and the smart styling, intended to create an impression of power and spaciousness. 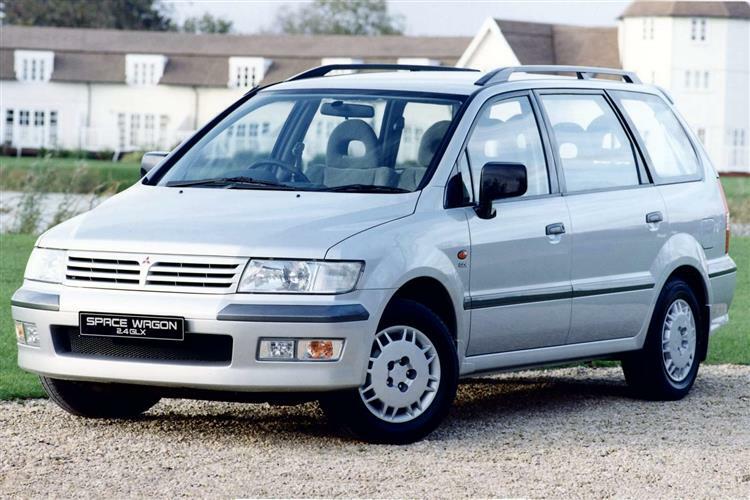 The third generation Mitsubishi Space Wagon offers a competitive blend of space, economy and reliability. If you're after something that can carry seven without the risk of deep vein thrombosis yet at the same time will easily negotiate the average multi-storey car park, the Space Star is a good bet. There's little reason to go for the 2.0-litre versions, being both slower and thirstier than the excellent 2.4 GDI models. With used prices now looking affordable, the Space Star could well find its way onto more than a few shortlists.